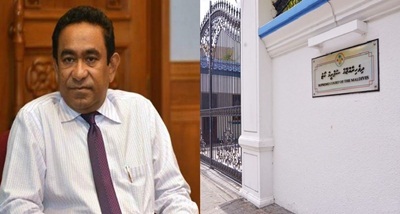 Maldives Supreme Court has ruled against admissibility of secret witnesses in a petition by President Abdulla Yameen to cancel the elections last month. The court delivered the ruling this afternoon after a three-day hearing during which the president’s lawyer argued that witnesses could face serious threats if their identities were revealed. The lawyer also alleged that the voting procedures in the presidential election were designed to favor his opponents. The Elections Commission’s lawyer objected to allowing the secret witnesses in a case and asserted for fairness of elections. President Yameen is contesting the election results despite publicly accepting his defeat against opposition candidate Ibrahim Mohamed Solih. The latter is scheduled to take over as new President on 17th November.